Giardia in dogs (full name is 'Giardiosis) is caused by tiny, single-cell internal parasites which set up home in Fido's gastrointestinal tract. This disease is also know as 'Beaver Fever'. Dogs of all ages are at risk of contracting Giardia, but young puppies, senior dogs, or dogs whose immune systems are weakened by stress, or another illness or health problem, are most at risk. The Giardia organisms occur all across the US (and in many other countries). They're usually found in water that's been contaminated by the feces of infected animals - such as streams, creeks, ponds and lakes. And Giardiasis isn't limited to dogs, many other species of animals, both domestic and wild (including Beavers!) can be infected, including humans. Fortunately Giardiasis is very unlikely to be transmitted from dogs to people (because each species is affected by different strains). However, although the risk is very slight, it still exists, so use excellent hygiene practices at all times. Dogs and other animals often ingest Giardia protozoa by drinking the infected water or playing/swimming in it. People can catch it from swimming in, or occasionally by drinking from, water supplies that have become contaminated by sewage. If vegetables/fruit are grown in contaminated soil or watered with contaminated water, giardia could potentially be found on them... just another reason to wash all produce thoroughly! Once inside the host's body, Giardia attach themselves to the inside of the intestinal walls, and develop into cysts which multiply rapidly, and may cause irritation, pain, interrupt the way your pup's body absorbs nutrients from his food and generally make life miserable. The life-cycle of these organisms causes the cysts to be shed inside the gastrointestinal tract and excreted in your pup's feces. They may then be ingested by another animal and start all over again in a new host. Over time, the infestation does cause damage and symptoms eventually appear, but even while they seem perfectly healthy, they are a risk to other pets and animals who can catch the disease from their infected stools. Outwardly healthy puppies or older dogs can be 'carriers' of Giardia... which means that they have the organisms in their bodies but don't get sick (they're 'asymptomatic'). Even though they don't show symptoms or suffer any ill effects, they are still a risk to other animals as they can transmit the disease in their stools. Symptoms of Giardiasis in dogs aren't always obvious at first, but even then a dog is sick and damage is being done at a cellular level. Chronic - intermittent, may come and go over several weeks. Usually less severe. 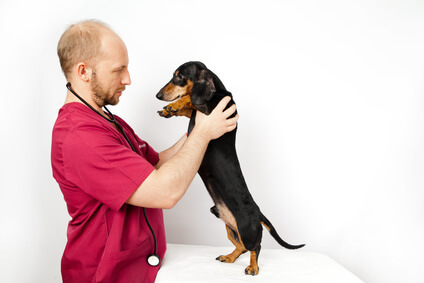 Diarrhea in puppies can also be a symptoms of other illnesses and conditions. The most serious of these is Canine Parvovirus, a VERY dangerous illness which can kill your puppy within days (sometimes within 24 hours). 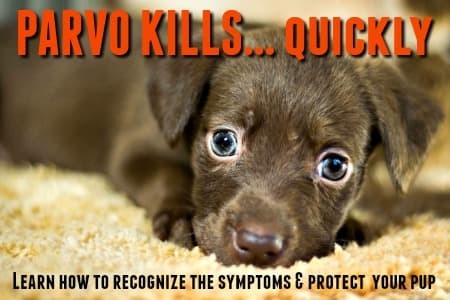 Parvo is the #1 risk to your puppy's health, and early detection and treatment are the only chance he will have of survival. 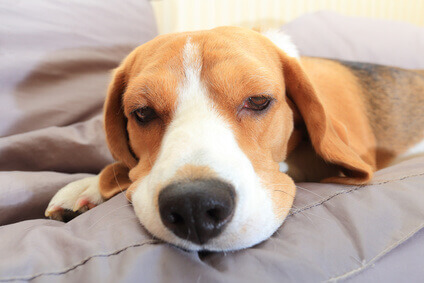 The diarrhea that's associated with Giardia in dogs is usually very watery and has a strong and very unpleasant smell! It might be pale, or foamy, or contain mucus and/or streaks of blood. If your puppy has repeated watery diarrhea, get him examined by your vet immediately to rule out Parvo. Your veterinarian can test for Giardiasis by testing a sample of your pup's poop for the tell-tale Giardia cysts that have been shed. But because these cysts are very tiny, and not shed constantly, it's possible to get a negative result even in animals who actually have the disease. If your pup has the right symptoms, and has possibly been exposed to Giardia, then your vet may test your pup's stools several times over a period of a few days. There are also blood tests now available to test for Giardia in dogs, and these are far more accurate than testing stool samples. Luckily, treatment for giardia is usually fairly straightforward. You vet will probably prescribe an antiparasitic medication for you to give your pup for about a week. The most common medication used to treat Giardia in dogs is Metronidazole (known as Flagyl) and it works well. If your pup's infestation doesn't respond to this, then there are other possible medications your vet can try, including Fenbendazole (Panacur). Metronidazole shouldn't be given to dogs who are pregnant as it could cause birth defects in the unborn puppies. So, make sure to let your vet know if your dog is diagnosed with canine giardia and could be pregnant. The bad news is that these treatments don't always totally eliminate the Giardia protozoa first time around. This means that although your pup is feeling much better, he could still carry the disease and risk passing it on to other animals, or have a relapse later on. So, if your puppy has been treated for Giardiosis, and his symptoms disappear, just be aware that it could show up again later on - and take him straight back to your vet if symptoms do reappear. Unfortunately, unlike with many dog illnesses, Fido will not become immune to Giardia if he's had it and recovered, he can get it again if re-exposed. 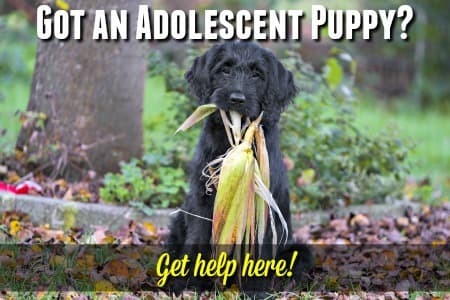 There are many different strains of Giardiosis, and just because your puppy has had the disease once, it doesn't rule out the possibility that he could catch a different strain another time... but at least now you will be familiar with the symptoms, and able to recognize the problem quickly. Provide a constant supply of clean water to drink (so he's not tempted by contaminated sources). Don't allow Fido to drink from streams/puddles/standing water etc. Giardia in dogs are very hardy little parasites, and eliminating them from your environment can be a challenge. A 1:10 or even 1:5 bleach/water solution is usually effective on hard floors and cement. Cleaners aren't effective in killing Giardia on grass or soil, but direct sunlight is. So are Lysol, and Quaternary ammonium disinfectants, which are antibacterial cleansers usually used by farmers for bacteria control. Steam cleaning carpets or soft furnishings is recommended. Dog food bowls and toys can be put in the dishwasher on a heavy-duty cycle, or soaked in boiling water for 2 - 3 minutes. Clothing, dog towels, dog bedding and such can go in the washing machine on a 'hot' setting and be tumble-dried on high-heat setting too. Always wear rubber or latex gloves when picking up/removing stools and when cleaning areas where Giardia protozoa may be present. Because there can occasionally be a small risk of Giardiosis being transmitted to humans (depending on the strain present), excellent personal hygiene is highly recommended if your pup is infected! If your dog has Giardia and you notice any flu-like symptoms, or vomiting/diarrhea in yourself or other members of your family, visit your doctor.